Index Node (inode) is a basic concept in Linux/Unix. Index node/number (inode) is a data structure which contain the information about a file in your server/hosting account. If the account has reached the maximum inodes allocated for your account then it’ll affect your account, website and email performance. How to know the inodes usage? This will give the Inode usage of your current working directory. If you need to find the Inode usage of your entire hosting account, execute this command in the location /home/user. Here’re some suggestions to reduce the inode usage in your account. Remove all unnecessary files and folder fdrom your account. 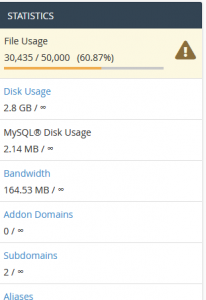 Other usage likeIf your account still uses large number of files you can take a look at the “Disk Usage” from cPanel. This will give you the information regarding the disk used by your account.